Know your limitations. Foghorn likes to sneak up on Barnyard Dog and slap him with a wooden board. If he’s not careful to stay outside the limits of the dog’s chain, he’s in big trouble. Kids can learn about safety and playing within set boundaries. It pays to be prepared. When he does lose his feathers, Foghorn likes to point out that, “Fortunately, I say fortunately, I keep mah feathuhs numbered, for just such an emergency.” This is a good lesson in being prepared for emergencies. The importance of mentoring. Henery Hawk doesn’t have a dad to help him work out how to become a full-fledged chicken hawk. Foghorn Leghorn is only too happy to play that role, and show Henery how to go about catching himself a chicken. Here is a lesson in being a role model. The role of a Dad in the home. Every now and then, Foghorn takes young Egghead Jr. under his wing. It’s usually motivated by his romantic interest in Jr.’s mom, Miss Prissy. Still, it’s a good opportunity to talk with your child about the role that dads play in a family. Keeping a positive attitude. Foghorn enjoys life. While he’s quite a prankster, he does get the most out of everything he does, often humming the tune “Camptown Races” while he’s going about his business. Use a sing-along to teach kids how to keep a positive outlook while they are doing chores, for instance. A time for work and a time for play. As we mentioned, Foghorn really loves to play pranks on Barnyard Dog. He often takes it too far, though, and doesn’t focus much on his other duties. This is a good point for kids to learn about balancing play with homework or chores. Play safely so that no one gets hurt. As with other animated series of that period, Looney Tunes characters were introduced to a largely adult audience through the medium of movie theaters. The humor at times could be viewed by some as too violent for kids. It’s an opportunity to talk with them about playing safely (ie no matches, fireworks, electricity, etc.). It’s wrong to be deceitful. In teaching Henery Hawk how to become an effective chicken hawk, Foghorn’s first strategy is to convince Henery that he’s not a chicken (rooster), in order to keep Henery from chasing him. So he fibs, and tells Henery that Barnyard Dog is the “real” chicken. Lying about it always comes back to bite Foghorn. A lesson in honesty and integrity. Folksy wisdom gets the message across. 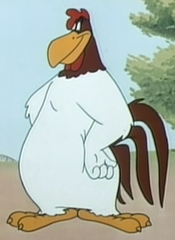 Foghorn leghorn’s down-home laconic style of speech has a way of conveying a thought that sticks with a person. Such observations as, “She remi – I say, she reminds me of Paul Revere’s ride, a little light in the belfry,” drive home the point in a memorable way. Kids can learn a thing or two about effective communication from this bellicose rooster.